So often we hear Midlife women bemoaning the fact that nobody sees them anymore. They feel invisible and they feel overlooked. But really, it doesn't take much to step out of that "grey zone" and to be recognized as viable and worth being paid attention to. It's not rocket science - the answer is so simple and it begins with a smile. 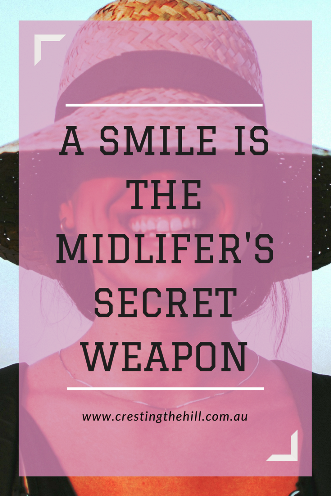 A smile is a Midlife woman’s secret weapon against invisibility - when we use it properly it helps us to be seen and to be happy. If we start to really be present, to be involved, and to be interested in other people, we open ourselves up to being seen as the vibrant and valuable women that we are. Midlife women who think they're becoming invisible can end up overcompensating in their pursuit of being recognized as worthwhile members of society. Too often we see examples of women thinking they need to be "loud and proud" to be seen. There are Facebook and Instagram groups of Midlifers thrusting themselves out into the world shouting to be seen. That might work for them, but is it really necessary? What if we chose to smile instead. What if we just started by greeting everyone with a smile and a "Hi" and really cared enough - to the point where our smile was real and lit up our eyes. The cloak of invisibility can't withstand a woman who is bright and buoyant and who truly cares about others - the cloak falls away and we become visible and valuable. It's hard to be unhappy if you smile - the old "fake it til you make it" mantra has a grain of truth to it. Happiness comes from inside us - we don't have to wait for our circumstances to be perfect before we crack a smile. We can smile despite what is going on around us, we can choose to live life with the attitude that our glass is ¾ full - that's enough to make anyone happy! It's all about having an attitude of gratitude and remembering how blessed we really are. Don't waste Midlife sitting around waiting for those adult kids to ring - they're busy with their own lives and will get around to us eventually. Don't sit in a boring job hoping it will change - get out there and find something that makes going to work a pleasure instead of a pain. Don't hold on to toxic friends - leave them to their own devices and go and find people who build you up rather than tearing you down. Be proactive and create your own happiness now - don't wait for it to magically come to you. Live in the now - don't dwell on past hurts or regrets. You can't go back and undo what's been said or done. You can choose to forgive if you've been wronged - or better still, you can choose to apologize if you're responsible for any of the upset or misunderstanding. It's time to let go of the past and to live fully in the present. Being present also means not waiting for future events to occur before you can be happy. It's nice to think that good things are coming, but in the meantime make the most of what you have here and now. Make coffee dates with your friends, go out with your partner and do something fun together, visit the kids, love on the grandbabies, live and laugh and make the most of every minute you've been blessed with. Time is short - let's savour the moment! Are you contributing to anything bigger than yourself? Have you thought about what you can do to make the world a better place? What can you get involved in that will bring a smile to your face or to the face of someone else? Volunteering is a wonderful place to start, and the great thing about volunteering is that there's something for everyone. I volunteer at our local primary school once a week, Sue from Sizzling Towards 60 and Beyond volunteers at her mother-in-law's aged care facility. Others help out at their church or in their local community. If you're not sure where to start, I'd suggest Googling it - I bet there's somewhere local where you could get involved and lift your spirits by helping out and lifting the load of others. The easiest way to be interestING is to be interstED. People love to be noticed and love to be heard. If you show a genuine interest in others you will reap the benefit of making them feel great and in the process you'll find yourself smiling in return. There are articles plastered all over the internet on how to be interested in other people. How sad is it that we have to be instructed on how to relate to our fellow human beings. It's not hard - take time to listen, take time to make eye contact, take time to be present and engaged. People will respond if you show interest, conversations start, friendships are made and strengthened. It's hard to overlook or ignore someone who is genuinely interested in you - it's another way to dispense with that pesky cloak of invisibility! Are you choosing to be bright and buoyant rather than invisible? Do you have a smile for everyone you meet and an upbeat, grateful approach to life? 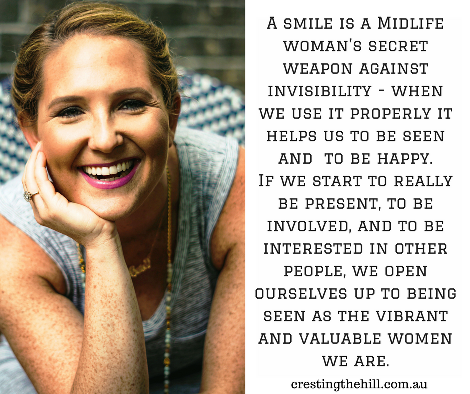 Have you chosen to smile and be happy, or is it time to make a change and embrace being seen? It's always about choosing our attitude isn't it Sue? Every single thing that comes our way depends on how we choose to view it - if we look for sunshine and positives then we always have something to smile about and that spills over onto others. I have to admit that I am a huge smiler!! In fact, it's hard for me not to smile and show how much I like people. Not that it's bad to show people we are still here and not invisible, but I want each person to feel special!! I love your post! I have been trying to recognize the smiles in my life. I have started posting on my blog on Saturdays what made me smile during the week. It has helped me smile more. Hi Ellen - I popped over and had a read of your Saturday posts - what a great idea to stop and look back and recognize the little joys we've experienced during the week - it makes all the difference doesn't it? Great post to start the week. Creating our own happiness is my way of thinking. Exactly Haralee! If we don't choose to be happy with what we've been given in life then we only have ourselves to blame. I want to be the smiley person - not the grump! This was and has been my mantra for this now past summer season! I'm going into the new season with new ideas, new ventures and all done with a smile. Leanne, these are such words of wealth in this article. I feel the same way Laurie - if we top everything we do with a smile then it almost doubles its value. People are just drawn to warm, smiling women aren't they? I think we all have the responsibility to see ourselves first and to ensure that our needs as a human being are being met. This ultimately leads to our happiness. But we also have the responsibility to see others, no matter their age or status in life. By doing so, we are helping others with their needs and eventual happiness. The world will surely be a much better place if we all do this. I completely agree with you Sigrid - we need to fill our own vessel and then use that fullness to pour into the lives of others. If we are content within ourselves, we have reservoirs to draw on in times of stress and we can share that with those around us. Just reading this post makes me smile and that makes me happy ! Thanks, Leanne. That was the intention Cathy - it's always good to remind ourselves to be upbeat and to smile - it changes the whole day for us if we do. Great reminder! Sometimes I get all caught up in my head and forget to be mindful of what good is around me and smile. I am a firm believer in "fake it til you make it" and have experienced the attitude change first hand when I've pushed away negative thoughts and embraced happy ones. It's been something that I've learned to do over time too Janis - we have the power to choose our thoughts and our responses, so why not exercise that power for our own benefit and the benefit of others - it must make the world a better place! Great post, Leanne! I agree that a smile is a very powerful thing for both the giver and the receiver! It is such a simple thing too! Thanks for sharing this insight! As the years slip by, we all know that gravity starts to take over, so by smiling you not only make yourself feel happy, but those around you smile back. It takes no effort and in the meantime, it makes those sagging facial muscles turn up instead of down. Works for me! Remember, laugh and the world laughs with you, weep and you weep alone. A lovely post Leanne. I've noticed my smile lines are a bit lower than they used to be - but I only see that when I'm not smiling - so I'll be following along behind you smiling at everyone too! Hi, Leanne - I completely agree that a smile can be a very powerful change-agent. It's free, easy to use, and often contagious. You're so right Donna - I love that it's contagious and is so easy to conjure up if you're choosing to be postive and proactive. Hello Leanne, a smile makes a lot of difference. I try my best to be cheerful, practical and look at the positives. Lots of valuable tips in your post. I imagine you'd be quite an upbeat guy Pradeep - your posts are always positive and looking for the best the world has to offer. Hi Deb - thanks for sharing and thanks for linking your post to mine - I felt very honoured when I read it and saw the link and quote. I think we're both on the same page where we don't want to be the little old gray haired, beige, purse lipped women fading into the background while we mutter about people. We want to be bright and cheerful and inclusive - the more women we can get to join us, the better life will be! Leanne I have always smiled a lot. I think it is funny because I have been stopped before and told what a pretty smile I have. I thinking smiling helps almost any time and faking it till you make does work. I am a smiler by nature and I have earned every crease in my face. There are times, and I can track it back to being overly focused on a particular outcome, that the process of 'smile and greet' feels superficial and I have to remind myself to go through the motions. I summarize people much too quickly and need to work on that. Thanks for a beautiful reminder of how powerful a genuine smile can be. Hi Leanne... Just waiting to see if my previous comment pops up here! Incase it doesn't... Brava for writing such a smart, well-thought out post! It definitely works Diane - I see your face smiling out at me next to your comments and I always feel like smiling back. Your mum seems to be a font of wise comments and this was another one that was full of truth. Kate I'm SO happy you've found somewhere that appreciates you before you gave up and faded into obscurity. What a shame the UK doesn't value people as much - I guess tough times in a country tends to make it grumpier? Hi Leanne, I agree with all of your listed "Be...". A genuine smile lifts our spirit and those around us. Thanks for solo hosting #MLSTL this week. Hi Natalie - I'm very happy to still be around to fly the #MLSTL banner while Sue is off cruising the world! I can even smile when I type that, so something in this post must be working! 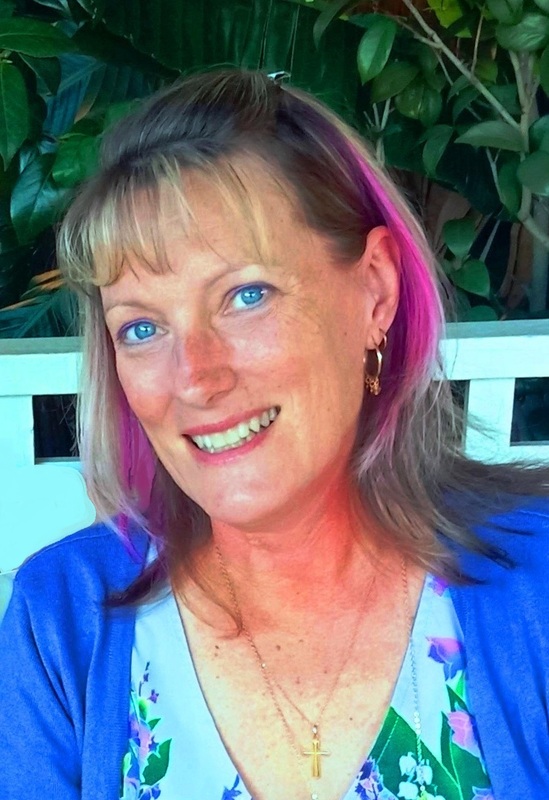 Hi,, Leanne - Thank you for 36 awesome link ups (and counting)! I have shared this post on my social media. #MLSTL. I world is growing old and cynical Patrick - I think I like the idea of being considered a bit crazy in comparison - keep smiling my friend! I think that's part of the growing old gracefully thing Janet "still we smile..." because we hope that things will be good again and the "this too shall pass" saying keeps us holding on until the sun comes out again. Well, I think you already know my view on smiling!! Just don't lose the ability to do it as I had to after cancer... Glad I got my smile back!! I'm glad you got it back too Denyse - your "sort of" smile was still pretty good though - but it's amazing what a difference some front teeth make! I think dealing with staff anywhere (on the giving or receiving end) always goes so much better with a smile and a gracious attitude Jennifer. As a receptionist I can tell you that people get a lot more from me with a smile than they do with a sour expression and a complaining attitude! This is such a good point! I love it! I actually was just thinking about this the other day when I was hash tagging photos on Instagram. One of the over 50 popular hashtags is "Forever Fierce". I thought, "Do I really want to be thought of as "Fierce"?" I wasn't quite sure. I agree about the smile. Especially as we age, we can tend to look mean with our "Resting Bi..h face". It takes a little extra effort to smile though. I wrote a post a while ago about wanting an alternative to Fierce Fifty Amy - I just don't like the whole "fierce" concept - I'd much rather grace with a smile - positive and pleasant work best for me and I know what you mean about "Resting BF" it seems to happen to us all in Midlife - which makes smiling even more vital! It's something I've been learning Christie - the most boring people I know are the ones who have nothing to offer in their conversation because they are so self involved they don't have the slightest inclination for a two way interaction! Excellent post. It made me smile just reading it - and now I want to run out into the world and smile at everyone. Loved it! I started intentionally using a smile as my "resting face" when I started taking public transportation in Beijing on a daily basis. I rarely saw anyone smile, either at each other or just at their own thoughts, so I decided if I wanted to see anyone smile, I'd better start the trend. It's quite entertaining seeing how others respond to a pleasant expression isn't it Red? How could you not smile when someone smiles at you - some people manage to stay glum and I think that's rather sad.